Best Sunset on the Lake! Property 10: Best Sunset on the Lake! Diamond Lake lakefront with beautiful sunsets! 5 bedrooms & a new master bath! Property 17: Diamond Lake lakefront with beautiful sunsets! 5 bedrooms & a new master bath! Nicely appointed kitchen and had everything we needed. If you want to be on the water or fish, pay the extra for the john boat- that was worth it. 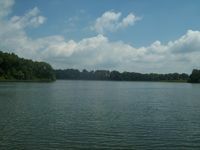 We caught tons of fish, mostly bass, and the trolling motor is perfect for this smaller lake. In the evening, we heard and saw cranes. Had a fire in the firepit and that was so relaxing. Main bedroom mattress and living room sofa need replacing as they're both very uncomfortable. The one next to the sliding glass door is far more comfortable but that one's facing the smaller tv in the play-area. Most of the games there were missing parts/pieces so couldn't be used. We were able to play Trouble- first time since childhood, lol- and I'd brought a deck of cards so there was that. The sunroom facing the lake is wonderful for its view and we loved having our breakfast there. One morning was super-foggy and it was just gorgeous. We had fun playing foosball and if you bring kids they have air hockey, basketball, darts, a paddle boat, and a canoe- so lots to do. On the first night I was having the allergy symptoms I get when I'm around a cat. In the morning, my eyes were so swollen &amp; my chest was tight. I was glad I'd brought our own pillows &amp; my allergy pills. Had to take one every day. I decided to check the furnace filter and OMG, it was absolutely filthy- caked with dust and crap- worst I've ever seen. So we turned off the system and went looking for a hardware store. We replaced the filter &amp; I cleaned the dust from the louvered doors in front of the furnace. When we left, I'd cleaned everything and we left it as we found it other than the back room needing a vacuuming from the bits of grass that get tracked in. I had removed their sheets, folded them, replaced with our own, and then re-made the bed before we left. Kitchen was spotless and everything washed and put away. I wiped down surfaces we never touched that were dirty. No part of the cleaning fee was returned. So if you stay here- you're paying for someone to clean it. Don't make my mistake and do it for them. Relax and leave your mess. If I saw that the mattress and sofa get replaced, we'd definitely stay again. Oh, if you go to Dowagiac, their downtown is lovely. We can highly recommend Zeke's restaurant. They mix a great drink and their burgers and onion rings are great. When I finally realized that summer was coming to an end, I jumped online to try and find a deal in our favorite vacation state, Michigan! Unfortunately, it was for their busiest holiday weekends- Labor Day. I was incredibly pleased to find this 'Creek Side Cottage' that was just big enough for our family of four with enough outside space to explore. The owners made it incredibly easy to book quickly and gave us great instructions on how to get to its tucked away location. Even kind enough to leave a light on for us as we arrived in the middle of the night. Our 3 year old loved exploring the creek and chasing frogs. Our 1 year old loved having a lot of grass to crawl around on. We loved how secluded the cottage was and just the right distance to our favorite beaches in South Haven and St Joseph. The owners were so kind and sincere and did everything to make our short stay a pleasant one. 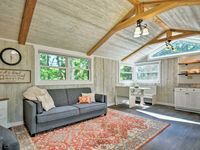 The cottage has everything we needed to be comfortable, with space for our children to play and for mommy and daddy to relax. The cottage was spotless and the furniture comfortable! The owners even gave us a tour of their dairy farm and our children were able to watch the milking process and pet new puppies! We enjoyed a great breakfast at the Bullseye Market one morning and the owner brought us fresh-from-the-fryer donuts one evening! We cannot wait to go back next year to make more memories and unplug!